The copy medals that we stock are of the highest quality. Where applicable our medals are hallmarked Sterling Silver. They are made in New Zealand by a craftsman who only produces quality items in small quantities. You may find other copied Rhodesian medals on offer around the world, in particular the RGSM, but none will come near ours for quality. In addition, when you purchase from us the money is being put to preservation of Rhodesian history - not someone's personal account. 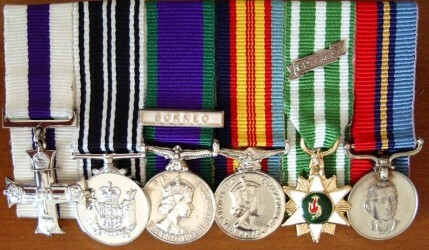 "Unauthorised use of and dealing in decorations, etc.- (1) Any person who, in the United Kingdom or in any colony,- (a)without authority uses or wears any military decoration, or any badge, wound stripe or emblem supplied or authorised by the Defence Council, or (b)uses or wears any decoration, badge, wound stripe, or emblem so nearly resembling any military decoration, or any such badge, stripe or emblem as aforesaid, as to be calculated to deceive, or (c)falsely represents himself to be a person who is or has been entitled to use or wear any such decoration, badge, stripe or emblem as is mentioned in paragraph (a) of this subsection, shall be guilty of an offence against this section." Please do not apply to us for a replacement medal if you are not entitled to it. We are happy to check records for you, but if our search does not find your name and you cannot provide proof, then we will not supply. We also do not stock, supply or support Commemorative or Vanity Medals. These are defined as medals created and manufactured without Crown or Government sanction and are self awarded. PLEASE NOTE that we can have your medals professionally mounted ready to wear. When ordering we will need to know what style Court or Swing mount. Awarded for brave and gallant conduct; this decoration was awarded to both civillians and members of the Security Forces in a non-combatant capacity. Please Note: We will only sell this medal to people who were awarded the medal. When you apply to buy we will check the Gazetted records and if you are not there you will be asked to provide proof of the award. Cast from bronze and handfinished. 100% New Zealand made. Initiated in 1969 and Awarded for service on operations undertaken for the purpose of combating terrorists or enemy incursions into Rhodesia. Cast from solid Sterling Silver or silver plated bronze and hand finished. 100% New Zealand made. 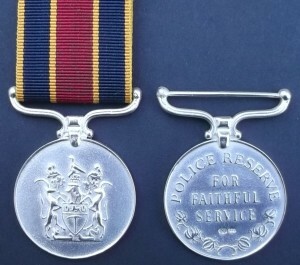 Awarded for long and exemplary service; awarded after 18 years; clasps for 25 and 30 years. Cast from solid Sterling Silver and hand finished. 100% New Zealand made. Note: * This ribbon is very scarce and price may vary with out notice dependent upon supply and the price we have to pay for the ribbon. 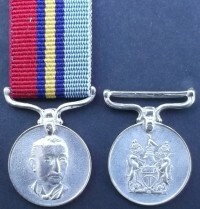 Full size copy Rhodesian Medal for Territorial or Reserve Service. 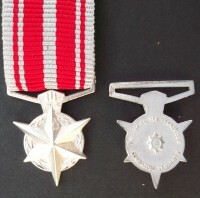 Awarded for long service in the Territorial, Volunteer and Reserve forces; awarded after 12 years unbroken service; clasps for 18 and 24 years. Cast from solid Sterling Silver with the lion and crosses plated with 18ct. gold and hand finished. 100% New Zealand made. 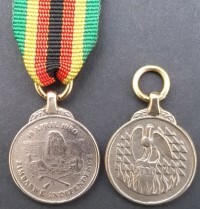 Awarded to those who served in Southern Rhodesia during the Second World War but who were ineligible for any of the campaign stars or war medals. This is one of the scarcest WWII medals with only 3,908 being awarded. This is the first known copy ever made available for sale to the public. It is cast from solid silver and is 100% New Zealand made. 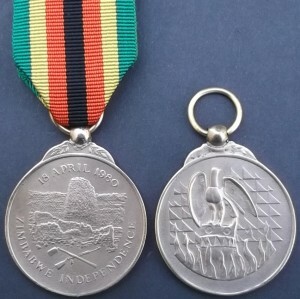 Original medals sell for US$600 upwards. Collectors are most welcome to purchase. Made from silver and handfinished - New Zealand made. Images above are not to scale. All these devices have been copied to a high degree of accuracy off originals. 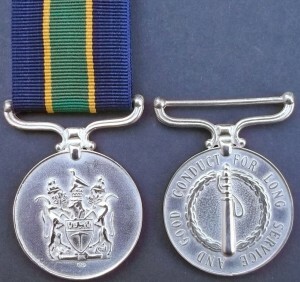 Military Forces Commendation Operational (silver pick) and Non Operational (bronze pick); BSAP - The Commissioner's Special Commendation for Bravery (silver baton) and The Commissioner's Commendation for Bravery (bronze baton), Intaf Oliphant (jewellery quality gold plate), rosettes and clasps (solid silver) for medals all available. All made in New Zealand to high quality. Ribbon bars as worn on serving soldier's uniform. These should not be worn in place of your medals on parade day. They are generally used for display and also find favour with veteran motor cycle group members for display on their riding jackets. 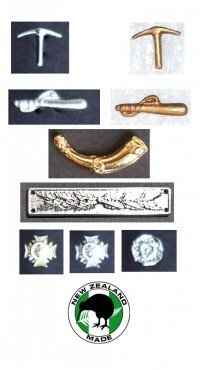 We stock a full range of brooch bars in all sizes (1 - 6 medal spaces) for mounting Full Size and Miniature medals. Safety pin fixing on back. We have limited stocks of many Rhodesian issued medal ribbons as well as some medals in full size and miniature. Please ask as not all may be listed below. The ribbons are extremely scarce now. If the ribbon is in short supply or very scarce we will only sell to the person to who the medal was issued or if deceased, the immediate family. Please contact me with your request. 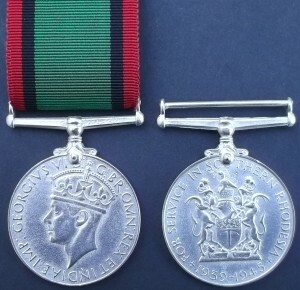 We can source copies of many British and Commonwealth medals as well as ribbons that would be required for Rhodesian groups ie: Malaya, WWII, WWI, Boer War. 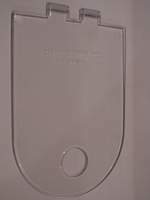 Pocket Insert Medal Holder - the medals are pinned through the loops at the top and then slid into the breast pocket eliminating the need to shove thick broach pins through the jacket and damaging the material. Size overall 130mm x 86mm. It should work for all 2 or more medal groups. For single medals a small modification may be required depending on the length of the brooch pin.